The Last Story's lead designer is considering the Wii U for his next project. 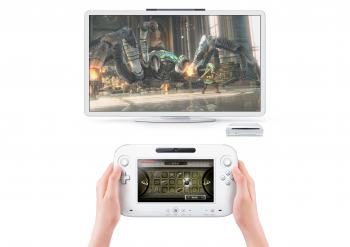 Whether you love or hate the Wii U's touchscreen controllers, we should all be able to agree that if implemented correctly, they would provide unique gameplay options for console players. The real question is which console genres are best suited to touchscreen controls? Blizzard has already speculated that the Wii U might be a good fit for RTS games, but The Last Story lead designer Takuya Matsumoto thinks that role playing games could benefit from a touchscreen design scheme, including JRPG games in particular. "I feel that the Wii U's interface, as with other tablet devices, works best for browsing and arranging information," Matsumoto said. "One merit is the ability to use a touch screen to directly manipulate information, such as looking up a monster's weak point or, like with a car's GPS, as a tool to understand battlefield conditions on a sub screen. This special feature will likely bring about opportunities for deep research into JRPG strategy." The Wii U will already highlight resource management gameplay elements in its upcoming ZombiU, but Matsumoto might have a point that JRPGs would make good use of a touchscreen as well. After all, the definitive version of the much-ported JRPG Chrono Trigger was the Nintendo DS edition with its dual-screen and touch-screen features, which sets a precedent for the kind of JRPG Matsumoto envisions for the Wii U. Sadly, the JRPG has not been as successful recently as publishers would hope, which may halt any plans to develop a Wii U JRPG before they can even begin. That said, Chrono Trigger's persistence and the movement to bring The Last Story to North America proves there is a market for such games. Matsumoto has already stated that he'd like to do a role playing game for the Wii U, so if The Last Story goes well, hopefully we can see what he has in mind in the future.